Dearest readers, has 2006 treated you well? The end of the year always makes me review how the year has been, & I can honestly say, it went by like a storm, fast n’ furious. 2006 was full of excitement & activity to a point of not having much energy left. I have been getting little sleep or rest because I’m busy until late every night & get woken up early every morning. A far cry from the old days…, when I used to sleep til 12 noon easy on weekends. Working & being a mum ain’t plain sailing. That said, doing something I am passionate about is so satisfying that I never find it a chore. And most importantly, my son is growing up well & there really is nothing major to complain. This year, the stall operation has become much smoother. I now use disposable cardboard food trays for transporting my produce from kitchen to market. It is something like 70p per tray & so I’m throwing away five to six pounds every week, but atleast I don’t need to wash them at the end of a tired Saturday like I used to. And the speed of me doing these cakes & chocolates has trippled it seems, as I have more practical experience under my belt. It was also a year of good girlfriends leaving London… Lisa, Layla, Nikki – three of ’em! *sigh…* But I mustn’t forget that it was also a year of meeting great new people too. The kindness I came across this year from some of these people still glow warmth in to my heart. This week I am in relax-mode since the market is not open. Drinking pink champagne, wine, beer & Otima 20 year old Tawny Port (which was seriously delicious) over the Christmas celebration that stretched several days. I also had the treat of going out in to town while my parents looked after our son. We first spent money like water on Winter Sales shopping, then ate Dim Sum for lunch. A de rigueur visit to La Maison du Chocolat, & then crossing the road to check out the sales shelves at Fortnum & Mason. Just before we went in to cinema to see the new James Bond movie (thumbs up to gorgeous Daniel Craig! 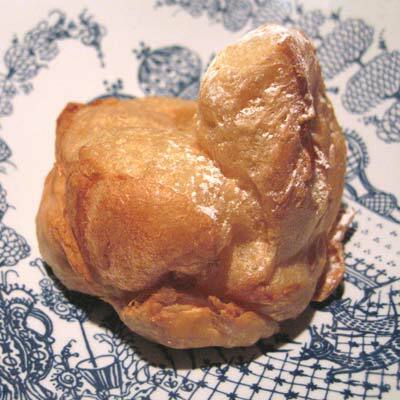 ), we bought the Beard Papa‘s Cream Puff (freshly made choux pastry with whipped cream custard piped inside)… Oh boy,,, it was de-licious! I love the fact that they bake the choux pastry several times daily on premises (the ovens were just behind the counter on view), & once an order is taken, they pipe the freshly made cream & do a little dusting of icing sugar all in front of you! How wonderfully fresh is that! It was soo cheap too – 10 cream puffs for 11 pounds (I think it was £1.30 for one). My only quarm is that the shop name works out odd in English (the shop is Japanese y’see), & the supposed ‘vanilla’ custard cream was seriously lacking in the ‘vanilla’ front. I only saw a dozen black specks of vanilla seeds in it – basically non-existant (I would have put in a lot lot more). Maybe this is what explains the low price since vanilla is an expensive ingredient afterall. – Despite this minor detail, the cream puff was crispy n’ creamy & I finished mine in nano second flat! And I can seriously reccomend you get one next time you’re in town, it’s opposite Uniqlo on Oxford Street, London. – Beard Papa, respect. I made roughly twice as much stuff than usual anticipating good sales – & yes! just as I hoped, the big cakes & the chocolates went in no time! I had stacks of pre-made chocolate boxes (twelve truffles inside) & I managed to sell-out on them by 11.30 in the morning. The ‘flourless chocolate cake’ (which I made 12 of) went by 2pm. 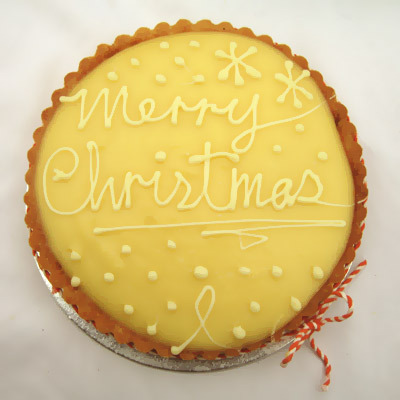 Along with pretty much all the other big cakes & tarts. I also had the pre-orders from my regulars. Truly amazing! So happy! Except my little items such as individual slices of cakes were slow on the uptake. To my annoyance I realized that I should have allocated the time making those to making more chocoates instead… (mental note for next year). So despite all that selling I had so much left, I ended up shouting; ‘End-of-day sale on cakes! Cake Discount! !’ (which, my technique is to look left & right for potential punters first, but never look at them as I say it because it’ll make them feel especially targeted & therefore make them feel uncomfortable…). I really, really hate shouting discount… (but I have to – my efforts that went on til 3am would go down the drain otherwise). It scratches at my pride & it invites petty hagglers to sneer over my produce. Like offer £1 for a tart that is priced £9, which I very politely tell ’em to stop joking and move on. The market itself was not as busy as I imagined though. Non-food stalls seemed to have a slow start. Most shoppers had a mission as it was the last few days to Christmas & was not cruising down the street like they normally do. Now that I think of it, I realize that this was the reason why my slices weren’t selling so well – the ‘cruisers’ who eat as they walk down the market weren’t around. What I truly love about working at the market is that I can fully experience the spirit of the festive season. Everyone wishes ‘Merry Christmas’ to one another. And when I say ‘Merry Christmas’ to the customers, I see their faces light up several notches & seem to take pleasure in repeating it back to me. The friendly market manager went around giving cups to all the stall holders for a swig of whisky: ‘Here, have that. Drink up in one go! It’ll warm you up.’ And it did. – There were also some customers who were festively loose with their purse s trings too – telling me to keep the change! Thank you! So, here we are, another Christmas. How will you be spending yours? For me, it’ll be about opening the presents that’s been patiently waiting underneath the Christmas tree in the hallway & then cooking up the celebration dinner from the morning. We’ll start the dinner from late afternoon. We’ll be feasting on the roast beef joint I bought from Richard at the market (a couple of stalls to my left), the good ol’ brussel sprouts, roast potatoes, home-made yorkshire puds… & lots of bubbly which has the power of making me deliriously happy than any other drink can do. Holiday: pretty cool – mostly been seeing friends & family & going shopping in amazing shops like Manufactum where they sell seriously the ‘best’ quality household goods they picked from around the world – There I bought a selection of Bonnat Chocolate Bars which seem much cheaper than in UK (Bonnat’s one of the best makers around), the most beautiful French Coffee Bowls (now I can drink coffee like those French films! ), a can opener that cost me twenty pounds (it better be good! ), an aluminium ice cube tray (which D insisted on buying as he used it when he was a child & that it is ‘the best’) & some other little objects like a kitchen sink strainer. It may not sound exciting for some people I’m sure, but for me this shop is heaven. Any product from here is a winner. Food: many many happy mugs of Glühwein at the outdoor Christmas Markets (getting red cheeked from the alcohol & the cold), & sausage n’ bread rolls from stalls. We’ve been scoffing on Germknödeln with cherries & vanilla sauce, & Baumkuchen. Also bought two different types of Stollen to take home. I AM NOT AT THE MARKET NEXT SATURDAY 16TH. HOLIDAYING IN HAMBURG. I WILL BE BACK WITH MANY MANY CHOCOLATES N’ CAKES ON SATURDAY 23RD! This week’s entry is about flour. Flour is the pillar of cakes & also the thickener of creams such as Crème Pâtissière. The most common flour you’d see at the supermarket is made from wheat. But flour can also be made from maize/ corn, barley, rye, rice, chestnut, chickpea, buckwheat. For pastry baking, the wheat kind is mostly used. – Never substitute the type of flour & expect the same recipe to work, as different flour types produce different amount of gluten. Without sounding atall scientific (which I’m not so clued up on anyway), I must write about the importance of gluten. It is responsible of the quality of your cake’s turnout. – The protein in the flour turns in to gluten when you add the ‘liquids’. During oven baking, the whisked egg whites would rise the cake, & the gluten from the flour would become the pillar to keep the cake in that risen shape. The correct amount of oven-heat would make this pillar solid & the cake will not deflate when it comes out. Do: always sift the flour – even if the packet says ready-sifted. It not only removes clogged up balls of flour (which will remain as flour balls in your baked cakes), importantly, it introduces ‘air’ in to the flour. It’ll be quicker to mix in the flour & successfully too. Some recipes might ask you to sift twice. Do: always measure flour after sifting. Do: store flour on a cool, dry, shelf in its bag or in an airtight container. Apparently, damp & warm conditions would invite little insects called ‘confused flour beetles’ & ‘red beetles’ to hatch in it. (As one of my Kid’s friend says, that’s just ‘yucky yuck’). So, never mix new flour with old. White flour generally keep well for 6 to 9 months. Do: mix the flour using the ‘folding’ technique; rotate the bowl with your left hand, dig your spatula to the bottom & lift it up in big movements, like you are cutting the mixture from the bottom. Keep rotating & cutting & stop when the white flour dissapears. Don’t: over-mix your cake dough – unless the recipe tells you to. Over-mixing would stregthen the gluten structure. You’d end up with a tough & dense sponge where the gluten had squashed the bubbles. … was a struggle. Every stall holder I’ve talked to was complaining about how there hadn’t been many spending customers. We realized that maybe it’s because it’s a run up to Christmas & people are holding on to their purse until the party season kick starts (hopefully from next Saturday please!). 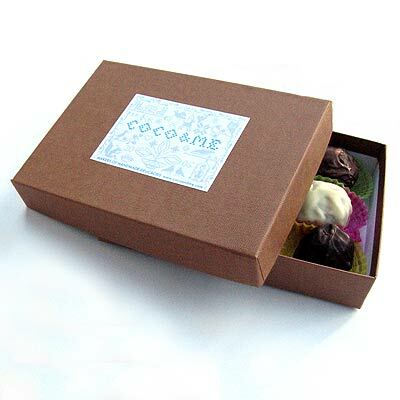 – Although the chocolate truffles (currently doing five types) goes down really well nowadays, & it got sold out quite quickly. I think it is because of the chocolate boxes I started using (pictured below), which costs £1.10 per box. It has a faux canvas texture, & the box is rigid. It’s a type of box you might want to keep, & it goes well with the ‘chocolate = luxury’ theory. – Before these boxes, I have been using self-assembly flat pack boxes made out of white glossy card which cost around 42 pence per box. Huge difference in cost I know, but the difference in quality is so crystal clear, I’ll never go back to those flimsy cheapo flat packs. I’m so happy I found these boxes, it makes me want to roll more truffles…! I have been slightly unwell all week & tired, so I made considerably less. No Tarte Tatins, Chocolate Tarts & no Gateaux Basques, & generally less quantities of everything. Actually I was thinking of not trading atall. But the customers would not trust me if I was unreliable. Next time they need a cake or some chocolates, they would not bother checking my stall out & buy elsewhere, right? – Making less turned out to be a good decision anyway, as formidable amount of rain bucketed down until lunch time, & business was slow. This week’s entry is about eggs. Prior to any cake recipes added to this blog, I’d like to throw in my two cents’ worth on the subject of basic ingredients such as eggs, butter, flour & sugar. The reason being… Before attempts are made at baking, it’s best to have knowledge of the ingredients & know how to handle them to get a good result. There is nothing more irritating than ending up with a bad turn out & not knowing why it happened (or blame me for it!). BUY ‘free range eggs‘. It may command more than double the price of standard eggs, but the hens are bred on better diet & the egg has stronger shell, firmer & strong yellow yolk – much tastier & it is worth the extra cost. It is approx. 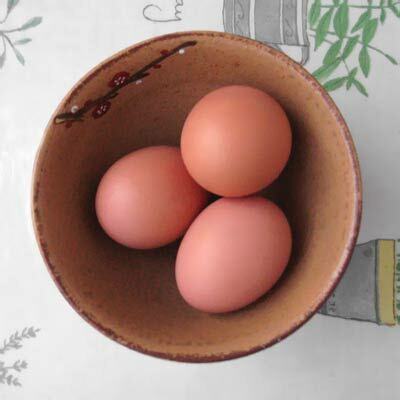 17 pence per egg… … … Or better still, buy ‘organic eggs’ approx. 24 pence per egg. (if you’re financially privilaged). Organic eggs are laid by healthy hens who have outdoor access. Their diet is organic – no pesticides, herbicides or fertilizers. Not fed any antibiotics, hormones or meat by-products (= parts of slaughtered animals, not including meat) to fatten them up or make them grow bigger… … … NEVER BUY ‘caged eggs’, ‘regular/ standard eggs’ approx. 7 pence per egg. These are ‘battery farmed’ chickens’, stuck in a small cage all day long, in artificially lit shed. Their diet contains antibiotics, hormones & other chemicals… … … If money is tight, buy ‘barn laid eggs’ approx. 13 pence per egg. Much more humane than ‘caged’, as they are in pens (although the hens are always kept indoors), & can be more ‘chicken-like’, spread their wings & socialize. Use Medium size eggs. Most cake recipes assume that an egg is approx. 50g (yolk 20g, whites 30g). using ‘large’ or ‘extra large’ would give you more whites than what the recipe calls for. During baking, one of the basic and common cake procedure is to mix sugar in to the yolk. Here, always whisk in the sugar straight away. Never leave the sugar standing in the yolk. This is because the sugar (just like salt) would soak up the water from the yolk & you’d end up with solidified yellow bits. Some eggs can have salmonella, on the shell as well as inside the egg. Eggs must be handled carefully both when it is still in its shell & once it is cracked open. – Please remember to: Keep eggs away from other foods. Always wash your hands, equipments & work surfaces after handling eggs to avoid cross-contamination. Do not use dirty or damaged eggs. And keep in mind that thoroughly cooking eggs properly kills bacteria. When I was new to all this baking, I had a hard time figuring out how best to beat the egg whites. I was full of questions such as ‘exactly at what timing do you incorporate the sugar?’. It’s plain obvious that correctly whipped egg whites are the core to any successful foam based cake. Getting it right is essential. 1. Put aside the precisely measured sugar ready in another bowl. 3. Crack the egg whites in to the bowl. Make sure there aren’t any trace of egg yolk. Yolk contains fat & it’ll prevent the egg whites from foaming well. 4. Start whisking the egg whites on medium speed. 5. Once the liquid has turned to foam (a cross between bubble-bath & a cappucino froth), pour 1/3 of your sugar from the side of the bowl. Turn the speed to High. 6. When the foam becomes finer, & you see fluffy peaks forming (like Summer clouds), add the second 1/3 of the sugar. 7. The last 1/3 should be incorporated when: the foam is shiny, you start to feel the resistence, & see defining peaks. 8. Just before you finish, rotate the whisk slowly around the bowl – this makes sure that all the foam is of equal size.